Most effective way to customize Twitter account is by using customized background image. We have seen number of online tools like twitbacks and Twitter designer to create cool Twitter background images and even resources that allow download of Twitter background images in original PSD format. If background image taken from your latest Flickr photo does not excite you, then check Twilk generator. 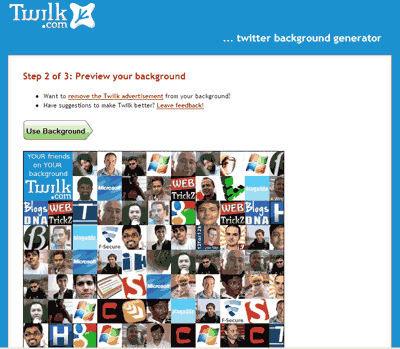 Twilk is an online tool to create Twitter background image from avatar images of your Twitter followers. To get started, login into your Twitter account and click allow for access to this tool. It will automatically generate background image with avatar images of your Follower friends. One more click will set that image as your current Twitter background. Checkout Twilk for follower avatar images laden Twitter background, like it? New Twitter Privacy Features, Birdie Gets Little Private!